How one Area Manager traveled 140.6 miles to the finish line. Houston Hobby Airport Area Manager Nicolle wears a lot of hats. She’s a mom of two toddlers, a wife, a former NCAA soccer athlete and a 10-year employee of Enterprise. And just last month, Nicolle earned another title: She’s an Ironwoman. 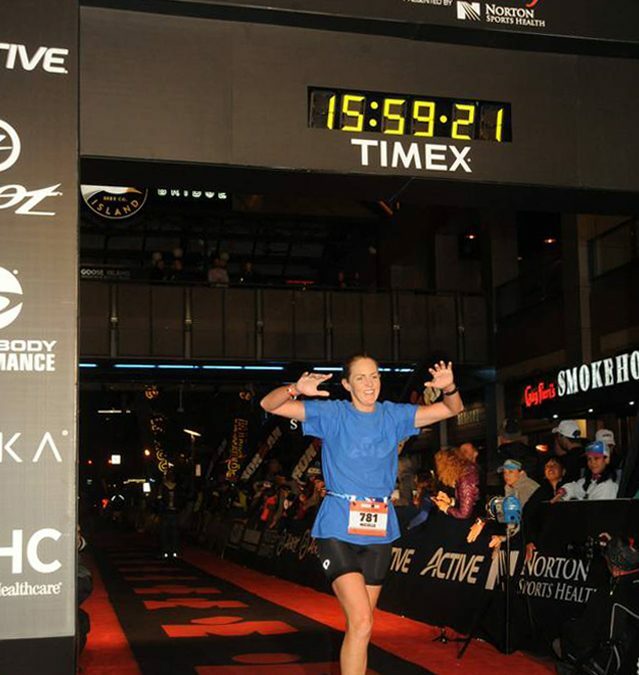 The fitness fanatic swam 2.4 miles, cycled 112 miles and ran 26.2 miles in Louisville, Kentucky, to complete her first Ironman triathlon. So what made Nicolle sign up for a race-day bib? She simply wanted to prove to herself and others that if you want something bad enough you’ll do what it takes to make it happen. That sparked the idea to run an Ironman. Nicolle wasted no time preparing, hitting the pavement and the pool before her youngest even turned one. “I’ve always been a strong believer that if we put something off until we’re not as busy, we’ll always find a reason not to do it,” says Nicolle. Beginning in January 2017, her training regimen entailed an hour in a spin class or swimming laps three mornings a week, and two evenings a week spent on a six- or eight-mile run. Weekends included 40- to 70-mile bike rides. Come race day on Oct. 15, Nicolle was well-conditioned. But nothing prepared her for the unexpected cold front that moved through during the cycling portion. Once she got there, though, the excitement of her family made everything worthwhile. “Seeing the joy and support of my son, daughter, husband, parents and aunt at the finish line was the absolute best,” recalls Nicolle. Her work family shared in the pride, too. After the race, Nicolle’s phone was full of supportive text messages from teammates who followed her progress through the event’s virtual tracker. If nothing else, Nicolle hopes her adventure helps set a healthy example of work-life balance for her colleagues. So would Nicolle do it all over again? There’s no rest for the weary, either. Nicolle is competing in an Olympic-size triathlon in December and has plans for another Ironman triathlon with her sister and mom in 2019.